Languages of Iraq. Ethnologue - Languages of the world. Religious and Ethnic Groups in Iraq. BBC News. Religious/Ethnic Composition of Diyala Province. Institute for the Study of War. Ethnoreligious Groups of Iraq. Global Security.org. 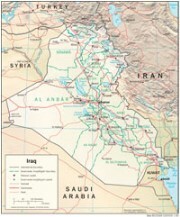 Iraq Info and Maps. ReliefWeb. Provinces of Iraq. Operation New Dawn. Irag Geographic Map. Food and Agriculture Organization of the United Nations. Iraq Map. By National Geographic. Map of Iraq. By Google. Map of Iraq. By MapQuest. Map of Iraq. The Lonely Planet. Iraq Maps. Perry-Castaneda Library Map Collection. The is one of the biggest collection of maps on Iraq. Iraq - Maps. Global Security.org. Maps of Iraq. The Institute for the Study of War has numerous maps of all sorts on its website to include maps depicting provinces, religious and ethnic composition, al-Qaeda activity, major roads, disposition of forces, Baghdad city districts, geography, and much more. Maps about War in Iraq. By National Public Radio (NPR). Map of Iraq Depicting Airfields. Defend America. Map of Northern Iraq. Understanding War.org. 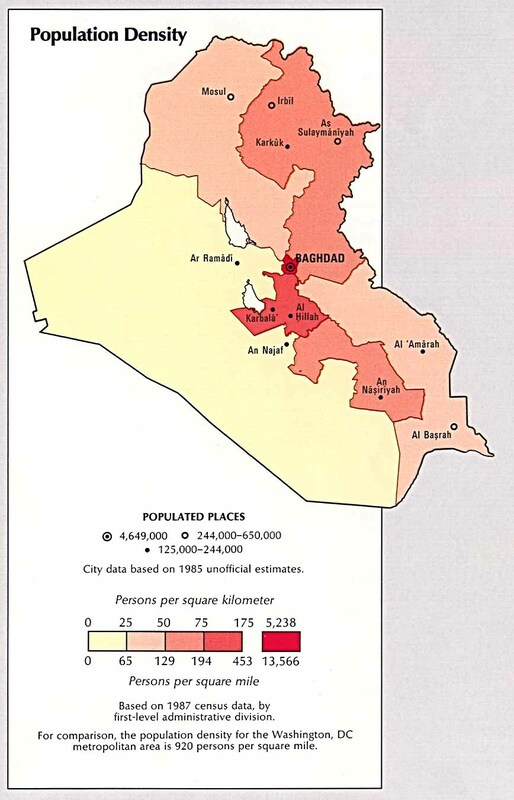 Population Density of Iraq. University of Texas Library. Oilfields and Pipelines of Iraq. U.S. Department of Energy. Circa 2003. PKK Bases in Northern Iraq. Middle East Strategy at Harvard (MESH). Iraq War Deaths. The Guardian (UK). Map depicting war deaths based on WikiLeaks reports. Map - Disposition of Forces in Iraq. Info as of 13 April 2003 by Strategy Page. Maps Covering the War. BBC News. Map of Military Targets in Iraq. Washington Post. "How the War Might be Waged". Bound for Baghdad by TIME. A pre-invasion map depicting possible invasion. 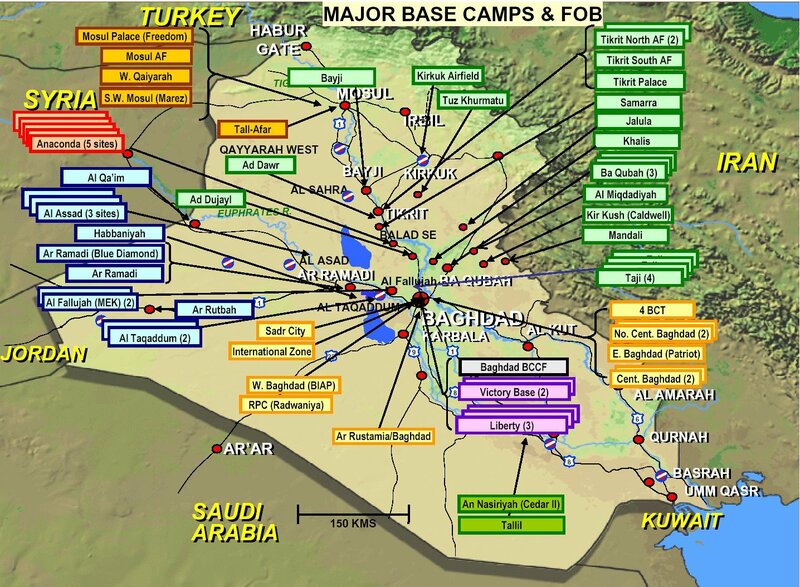 Major Base Camps and FOBs of Iraq. GlobalSecurity.org. Circa April 2005. Brigade Order of Battle for Iraq. Circa March 2009. Harvard MESH.